Dermal fillers are cosmetic injectable solutions that doctors inject into a patient’s skin to help fill in facial lines and wrinkles for a radiant and smoother appearance. 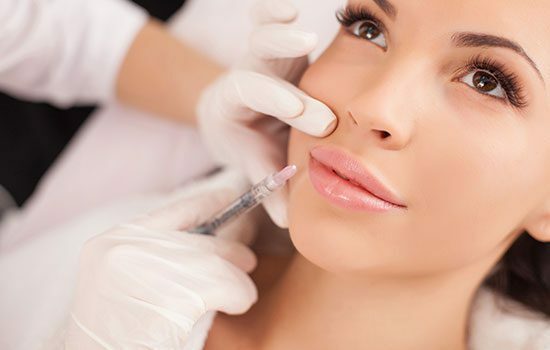 Doctors also use cosmetic fillers to add volume, enhance the lips, and contour the face. Most facial fillers are temporary, as they get absorbed by the body over time. Some patients may need more than one injection, depending on their skin type, condition, and desired results. Dermal fillers are used for diminishing the appearance of facial wrinkles, and restoring lost volume in the facial area. Use fillers to smooth out and add volume to deep creases, such as laugh lines or nasolabial folds, as well as for plumping the lips. Facial fillers can be also used for filling out hollows under the eye area, augmenting the cheeks, reducing the appearance of facial acne scars. Some fillers can be used to boost the skin’s hydration. Facial fillers improve the appearance of acne scars by lifting the depressed acne scars. Dermal fillers can give the patient an immediate result, which continues to improve over the next couple of months. This occurs as a result of the injection technique, which encourages collagen modification and production, due to fibroblasts stretching with the face filler. Dermal fillers help to improve the shape, size, and overall appearance of the cheeks. For example, doctors use facial fillers to enhance the cheekbones for a more refined look. It can also correct volume loss due to aging of lipoatrophy. Cosmetic injectables can help to correct uneven lips, fill in fine lines around the lips, and increase volume. This can help improve the proportion of the features and give your patient the luscious pout they’ve always desired. Fillers can also be used to help hydrate the lips and the surrounding skin for a healthier and more youthful look. Fillers are an option to reduce the appearance of dark circles under the eyes and smooth out wrinkles and hollows. Restoring volume to the area around the eyes helps to give your patient a refreshed and bright appearance. Some minor side effects may appear when using face fillers, which are mild in nature, and resolve on their own within a few days, depending on the filler that is used. If any side effects occur, and persist, patients should seek medical assistance immediately.